The campaign debuts with two films that will run on both TV and digital platforms. The stories focus on friendship and romance, two themes which appeal to Chinese youth. The first spot, “Friend Hunt” [which came out in June] centers around an invitation, using codes, to connect with friends for a special moment. . . . 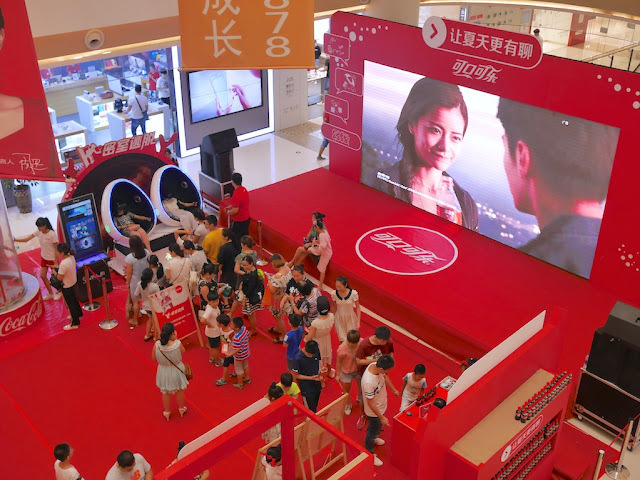 The second film, “Break-up”, [which came out in July] incorporates codes for consumers to trace a young couple’s relationship journey, from the first time they met, to their first date, first kiss, first fight and first break-up, and ultimately how they reconcile over a bottle of Coke. 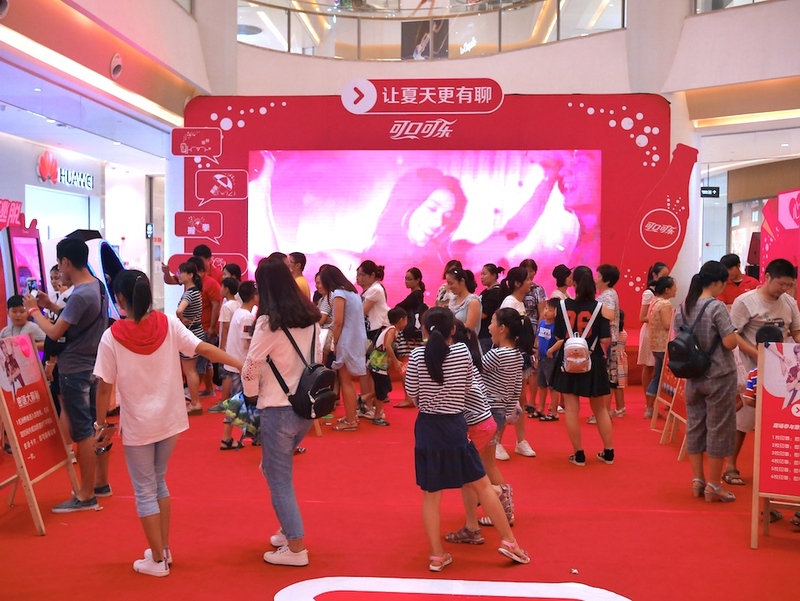 Versions of both ads were displayed yesterday in a Coca-Cola promotional event at the Intime City (银泰城) shopping center in Bengbu, Anhui province. 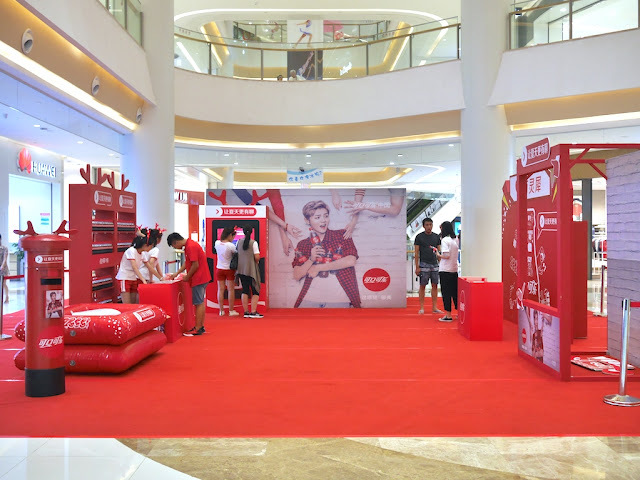 The last time I took a close look at a similar Coca-Cola promotion, I possibly came close to destroying one of the displays due to incorrectly believing the intended interaction involved slamming a red target as hard as one could. This time I decided to avoid any undesired feats of strength and just observed. In addition to the large video screen, there were interactive booths, none of which even to me looked like they required any hitting. The more stations visitors attended, the bigger of a gift they could receive in return. 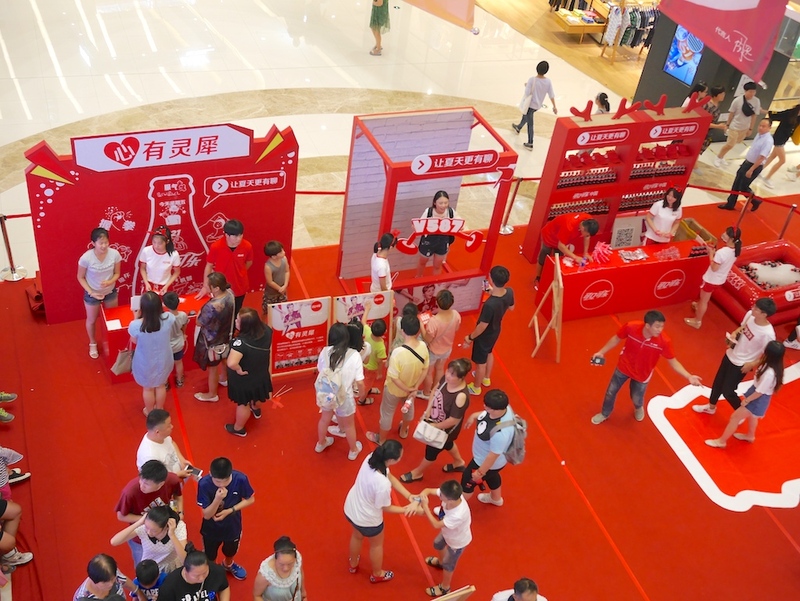 For example, with a stamp from one station visitors could get a small bottle of Coke. 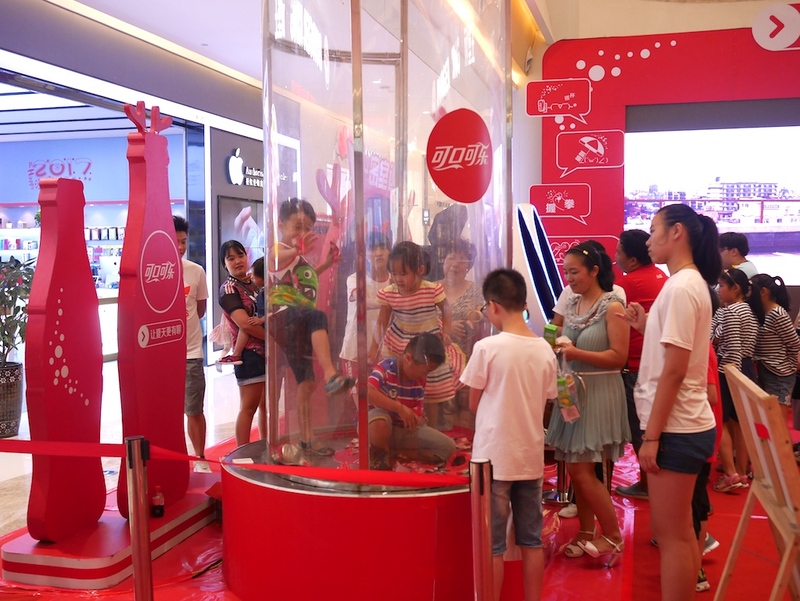 With five stamps, though, visitors could use a machine which produced a large Code bottle according to their own specifications. The station with the longest line was a virtual reality ride. Also popular was a money grabbing booth which somewhat ineffectively blew paper tokens instead of money. Of course there was plenty of Coke around. And at least some of the part-time staff were college students. The full festivities lasted just one day, and today only a scaled-down version remained. 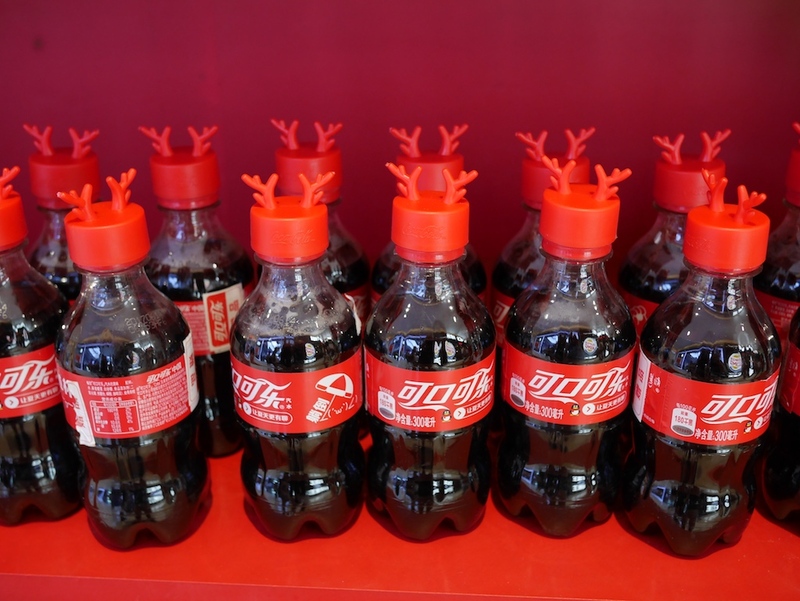 All of the red deer antlers on displays, bottles, and heads of female staff aren't signs of Coca-Cola getting into the winter holiday spirit way too early. Instead, they are an integral part of this and other Coco-Cola promotions featuring the popular Chinese singer and actor Lu Han, who is the main character in the "Friend Hunt" ad. 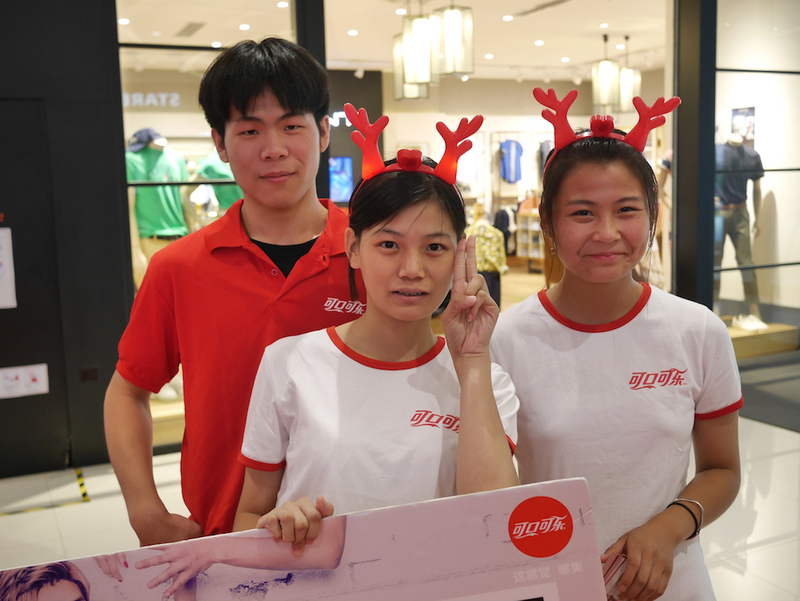 The character for "Lu" — 鹿 — in his name means "deer" and many of his fans wear deer antlers to show their support. One of Lu Han's performances in Beijing even set a Guinness World Records title for "largest gathering of people wearing antlers" with 1,731 participating. For context, this number surpasses the world record for "most dogs in costumed attire", which was set by 1326 dogs in St. Louis, USA, but falls well short of the world record for "largest gathering of people wearing false moustaches", which was set by 6,471 humans in Denver, USA. In addition to the antlers, the displays include other references to Lu Han, such as the Shanghai mailbox he made famous. So along with the codes, there was no shortage of symbolism. The event seemed to be a success in terms of turnout yesterday. They may have hoped for a slightly larger crowd when I happened to be observing, but many more people would have made it difficult to move around and participate. After conversations with some of the staff, I was given an small ice cold bottle of Coke. Perhaps they felt I had interacted enough despite not participating at any of the stations. Perhaps they were just happy I didn't mistake anything for a strength tester this time.